ATTLEBORO - U.S. Rep. Joseph Kennedy III took a look at both the old and the new in downtown redevelopment during a visit to the city Monday. 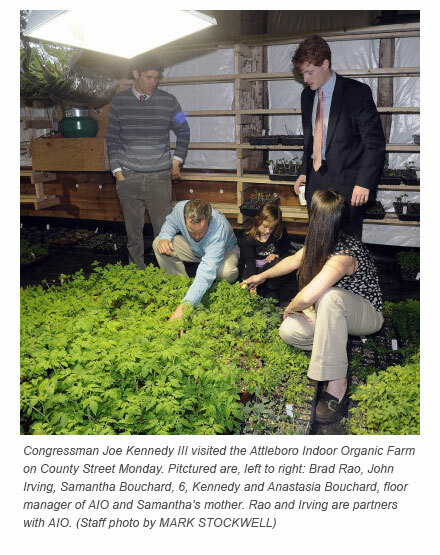 Kennedy dropped by Indoor Organic Farm of Attleboro, a company that raises seedlings and organic produce plants on the upper floor of a converted turn-of-the-century factory, as well as touring an urban renewal project in the MBTA commuter rail parking lot. Indoor Organic Farm has adapted space on the third floor of the building that houses Lambco Appliance and other industrial and office tenants to be used to grow small starter plants that are marketed through retail clients and farmers markets. IOH President Ashley Driscoll, who is related to the building's owner, said her company is an example of how older buildings can be re-purposed to play a role in modern economic development. She said she is seeking investment to expand her business and hopes that renewed economic activity in the area will rub off on the industrial complex. "When re-tooled, legacy buildings like ours will serve as a foundation for Attleboro's future," she said. Later, Kennedy toured the urban renewal project at the MBTA parking lot, previously the site of the New Haven Railroad's freight yard. There, Assistant Public Works Superintendent Ron Dubuc told Kennedy about work being done to construct a bus terminal at the 26-acre site with a private housing development to follow this summer. Dubuc said eventually the plan calls for a second private development, a parking garage and improved exits on to abutting streets. Most of the plans are funded, he said, except for the garage, which will cost $12 million to $14 million. Kennedy said federal funding can be more difficult to obtain from Congress now that it is dealing with budget cuts and deficits, but he will try to be helpful in any way possible..